Meet Dean! That's the guy in the khakis. He is a literal saint on Earth. He donates his time (and his skill) to making sure you, me, and depree, has the perfect pic for Instagram. Not only does he help you pose, and take the perfect picture - he does it all for FREE so don't be afraid to show him some love and give him a tip :) I think it is so neat what he does and would love to do the same thing when I'm old one day! People can draw so much happiness from having a perfect picture. So how do you nail the perfect pose at the sign? Weather you are posing alone, with someone, or in a group Dean knows EXACTLY what you should do for the perfect picture. You can obviously do what ever you want - jump, make a pyramid, or throw up the deuces. Dean has the perfect eye and will truly capture the moment. My best advice is to just have some fun! 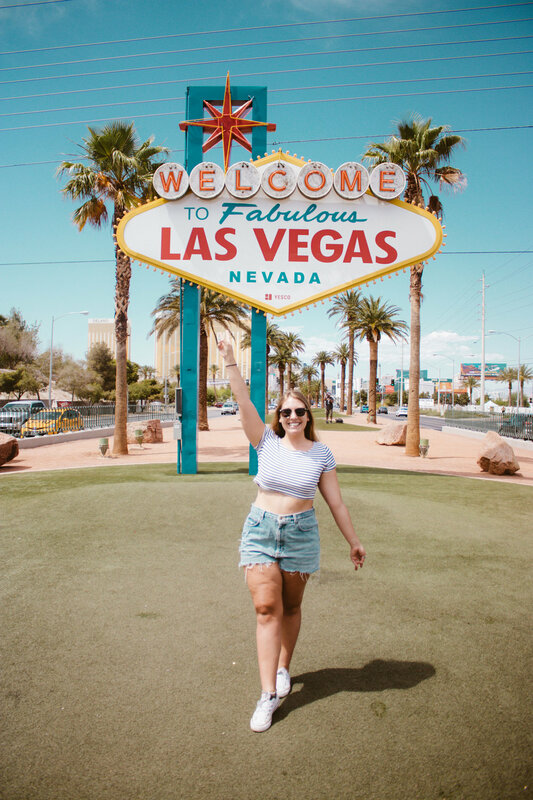 The Las Vegas Signs exact location is: 5200 S Las Vegas Blvd, Las Vegas, NV 89119 but you can find it on your smart phone Map by searching 'Welcome To Vegas Sign'. There is a large parking lot here for don't panic and park at the offices up the road! There is little shade here so do bring water. As my advice with any tourist attraction, go early! Nothing bad ever came from starting the day early. You'll avoid high temperatures and big crowds. However - you can expect a line almost anytime of day. It does move fast so don't freat! As I was leaving around 2 pm, a large tour bus dropped off 50 or so odd people so keep this in mind - tours can stop here! Think about your pose before hand! It was so fun watching everyone ahead of us pose and get some inspiration. You can choose to pose how ever you want and if you are truly lost - Dean has got you covered! Wear something that is comfortable but photographs well! I have learned a lot of what makes a good picture is style. Try to plan your outfit ahead of time and think about your surroundings and the colors. If you want any props [ie. bridesmaids sashes, crowns, posters, I saw it all..] make sure to bring them! Have fun! We photograph best when we are genuinely having a good time. You are standing at a historical landmark - loosen up show us those candid faces! Let's be honest, does one really go to Vegas without the iconic Seven Magic Mountain pic? I think not ðŸ˜Ž. This art exhibit has been on my 'insta' bucketlist for a while. I convinced my mom to make a drive with me and let's just say... it's totally worth it.